Today’s post is such a goodie! 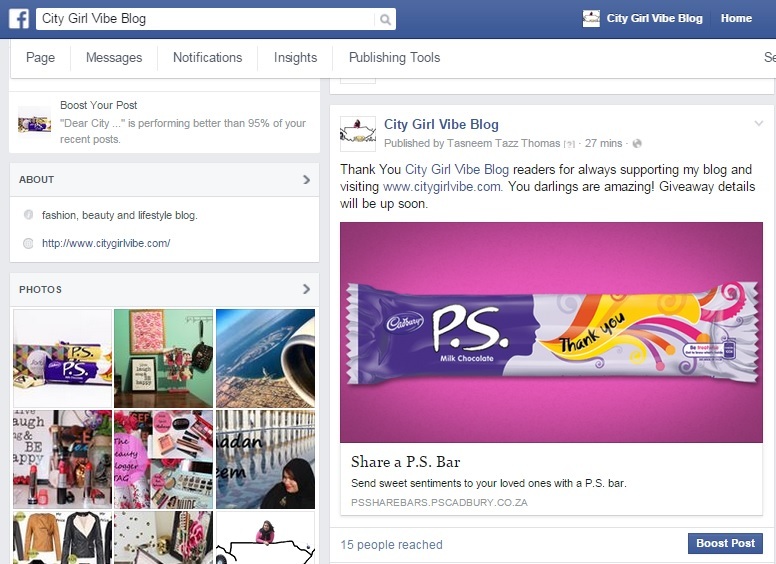 City Girl Vibe teamed up with Cadbury P.S to spoil my readers and let you in on this nifty new app that allows you to share virtual P.S. bars on different occasions to whomever, wherever! This P.S. Bars/messages can be sent via Facebook and the P.S. website. You know how in this day and age everything is practically done online and I feel that this share app is the perfect way to Congratulate, celebrate and share general well wishes. Who wouldn’t want receive a P.S chocolate anyway?! Who cares if its virtual, P.S chocolates are always a treat! The process in sending your virtual P.S is quite easy, you start by selecting your favourite flavour of Cadbury P.S. Caramilk or Milk chocolate, then select either an ‘Occasions’, ‘Celebrations’ or ‘General Sentiments’ message, and lastly share it on your friend’s Facebook timeline. It’s that easy to share your feelings with a loved one! So I decided to share my own P.S in the Milk Chocolate flavour on my Facebook page to Thank all of my readers for their continuous support and also to celebrate City Girl Vibe turning 4 years old. I hate running comps where you have to jump through hoops so I’m keeping it simple. All you have to do is send your loved one a PS bar via the Share bar app on Cadbury P.S’s website or Facebook page tagging the person and then sending me a screenshot via Twitter or Facebook. Don’t forget to use the #PSBFF #CityGirlVibeXCadburyPS #PSshareBar hashtag. Its that easy! P.s (excuse the pun) There’ll be two sets of winners. Tags: BFFS, Cadbury, Cadbury PS Share Bar, Chocolate, Giveaway, Love. Bookmark the permalink. Such a yummy competition 😉 Im entering too, I need all the pampering I can get when my little panini graces this world. What a fabulous chocoholic giveaway!! Would love to win this for my daughter’s teacher!! She is just THE BEST!! Still Sharing my 💟💟💟 out for this amazing give away! !